2 Can be used to glide while carrying. The Archaeopteryx (Ar-KAY-op-ter-ix) or Archa is one of the Creatures in ARK: Survival Evolved. Approximately one meter long, the Archaeopteryx magnamilvum is a primarily tree-dwelling proto-bird. It avoids the ground as much as possible, preferring to stay in the safety of the tree-line, where few predators can reach it. I've not seen an Archaeopteryx outright fly yet, so it's possible that they cannot generate enough lift to do more than glide long distances between perches. I'm not sure how a creature so fearful of the ground can be such a picky eater, but Archaeopteryx only seems to consume certain rare insect matter. The most likely explanation is that it tends to nest in infested trees, stripping them bare of such food sources. While not large enough to bear the full weight of an adult human, Archaeopteryx still has great utility. Despite the creature's inability to fly, its wings have sufficient strength to dramatically slow the rate of a person's descent, if that person holds onto Archaeopteryx while airborne. Taming Archaeopteryx can be somewhat troublesome, though, as it refuses to eat most common food sources, and glides to prospective safety at the first sign of any interloper. Due to the hostile environment in which it lives, Archaeopteryx often flees at the first sign of conflict. It can be found both wandering around the forest floor and high up in Redwood trees. Tamed animals retain their timid nature and lack any sort of attacking ability, even when set on aggressive, and will only eat Chitin. The Archaeopteryx has a unique blend of avian (birdlike) and reptilian features. Like a bird, its body is covered in feathers starting at the neck. Its arms have much longer feathers, creating a set of primitive wings; its tail also features longer plumage, which it uses as an aid for balance. However, the similarities to birds end there. The face is scaly and more elongated, like a reptile, with needle-sharp teeth in its mouth to shred apart insects. Additionally, unlike modern birds, the wings of Archaeopteryx end in sharp claws. These are used for scaling tall trees. This section displays the Archaeopteryx's natural colors and regions. 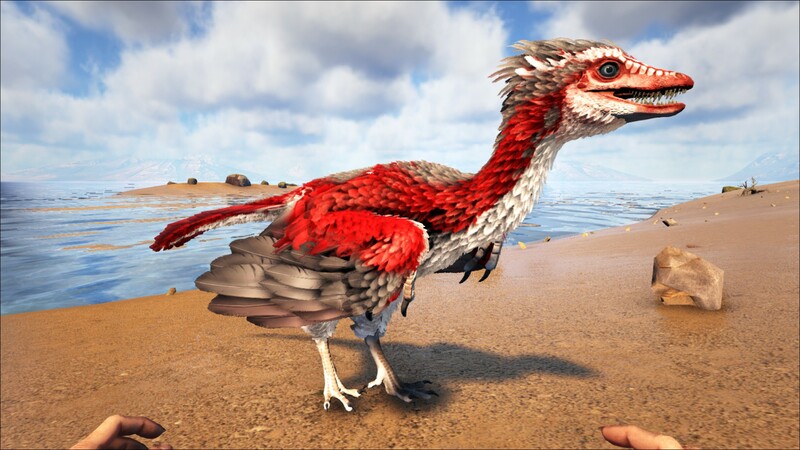 For demonstration, the regions below are colored red over an albino Archaeopteryx. 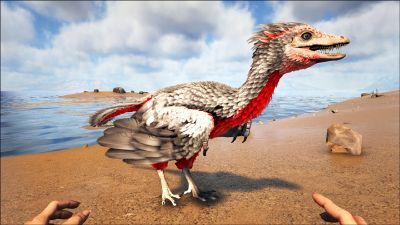 The colored squares shown underneath each region's description are the colors that the Archaeopteryx will randomly spawn with to provide an overall range of its natural color scheme. Hover your cursor over a color to display its name and ID. For example, "cheat SetTargetDinoColor 0 6" would color the Archaeopteryx's "sides, tail, wings and face" magenta. The Archa attacks the target. Occasionally, Archaeopteryx can be found wandering around on the forest floor. If one manages to spot an Archaeopteryx without scaring it away, the animal can be temporarily immobilized with a Bola. It would be best to use darts to knock one out, as a Bow or Crossbow could easily kill it. If you miss or scare it away before you can react, you might be able to follow it and see which tree they climb. The Archaeopteryx will only climb to a certain height, so you can try to throw a Bola at it or scare it from the tree to come down again. 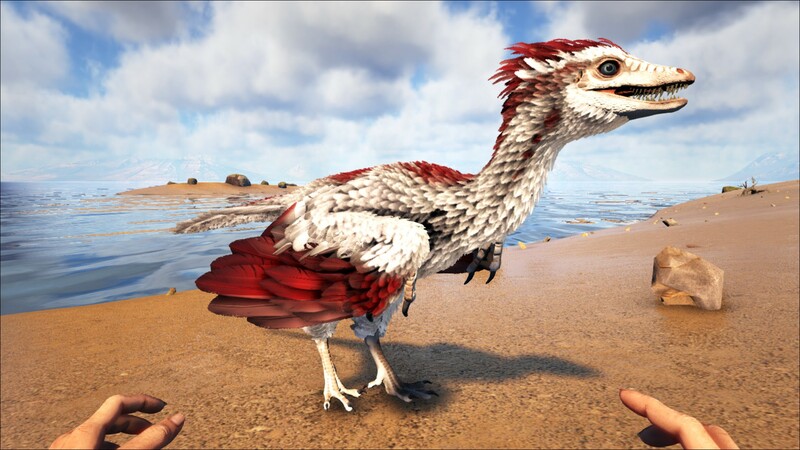 Once tamed, the Archaeopteryx will only eat Chitin, so make sure to have a steady supply before attempting to tame. This section describes how to fight against the Archaeopteryx. Archaeopteryx have a small amount of health, no attacks, and flee when approached. Any means of attack will work, so long as damage is done before it flees. Because the Archaeopteryx is quick to flee from any fight, it is best to use ranged weapons such as the Crossbow or Longneck Rifle. 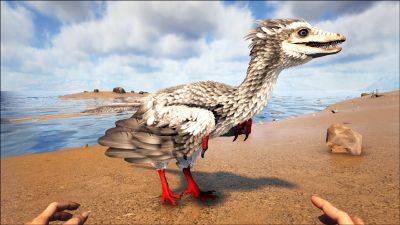 However, as long as the player has levelled up in movement speed at least a few times, and isn't encumbered, it should be easy enough to run down a fleeing Archaeopteryx and finish it off with a melee weapon like the Pike. There is no danger from the Archaeopteryx itself. However, the environment in which it resides has plenty of other predators to worry about. They have low health, so any attack will work so long as they are unable to flee once attacked. Sometimes while flying, players will accidentally hit the dismount button (e, , ) which is a frequently fatal mistake. Much like the Parachute, an Archaeopteryx held while flying will slow a falling survivor's descent. However, unlike the Parachute, the Archaeopteryx's gliding ability is so slow that players often are still in range of their flying mounts long enough to be able to remount while in mid-air. Players can make a quick getaway from danger by gliding away with an Archaeopteryx. Jumping from even the slightest difference in terrain can cause a player to soar considerable distances. With better maneuverability and slower fall speed than the Parachute, it's more appropriate to call Archaeopteryx a hang-glider. It allows players to jump considerable gaps and can allow for safe (albeit, slow) descents to safety. You are able to deactivate and reactivate this ability by pressing your Reload hotkey (r, , ). When set on wander, it will slowly gather Sap from Redwood and Joshua Trees. It collects around 1-2 Sap every 5–10 minutes (Values differ from the number of trees it visits). You should put a Transponder Node on your Archaeopteryx if you plan to use them for sap collection, as it is very easy to lose them. Despite being a winged creature, it can be carried by other (rideable) flying creatures. On Scorched earth, Archaeopteryx can be found wandering the cactus forests. On Scorched Earth, there is a humorous glitch that can happen on rare occasions regarding Archaeopteryx. They can be seen flying vertically into the sky for seemingly an endless amount of time, soaring higher and higher on a slow, 90-degree climb towards the top of the map's skybox. This might be a glitch if an Archaeopteryx has trouble latching onto a Joshua tree, as Archaeopteryx can also be found humorously flying circles around a single tree while calling repetitively. Falling with an Archaeopteryx can still sometimes be dangerous; the game uses vectors to determine your flight paths, which means that a large amount of speed down vertically can take time to correct horizontally. This page was last edited on 14 April 2019, at 22:31.